The Castle Butte at dusk in the Big Muddy Badlands of Southern Saskatchewan, Canada is surrounded by the fading light giving the land-form and scene a mythical aura. Castle Butte, in the Big Muddy Badlands of Southern Saskatchewan, Canada is situated about 200 kilometers south of Regina, the capital city of the province of Saskatchewan, and also close to the Montana border. There are many birds and animals in the valley of the Badlands, antelope, white-tailed and mule deer and the smaller denizens of the wild - skunks, porcupines, weasels and fox. Birds include falcons, golden eagles, vultures and even the burrowing owl. 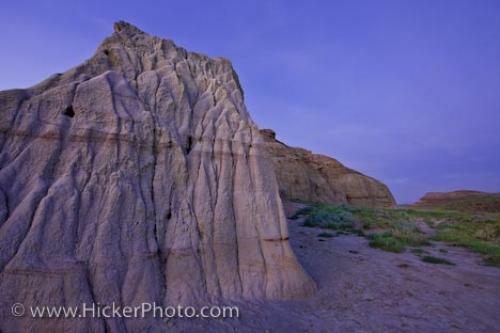 Photo of Castle Butte a mythical landform in the Big Muddy Badlands of Saskatchewan, Canada. ... It was also a place of refuge for the natives still alive after the Battle of Little Big Horn, including Chief Sitting Bull, and a popular meeting spot for outlaws such as Sam Kelley and Butch Cassidy. At dusk, though, Castle Butte looks like a fantasy land of mythical wizards and dragons. I photographed this photo with the digital SLR camera model Canon EOS-1Ds Mark III, aperture of f/8.0, exposure time of 25/10 sec. on ISO 100, as always I used a original Canon Lens, the focus lenght for this picture was 14mm.